MiMi, Kristie, Chloe and I had a lot of fun planning my cousin Cori's "Bun in the Oven" shower! We were so looking forward to getting everyone together to celebrate the coming addition to the family. Cori doesn't know if she is having a boy or a girl and it is driving us all nuts! We can't wait to find out! MiMi was in charge of the dessert table. She made a variety of mini BUNdt cakes. (Get it?!) There were chocolate cakes, banana cakes, blue raspberry ones and a pink camouflage cake as well! Of course having so many varieties makes it really hard to choose! 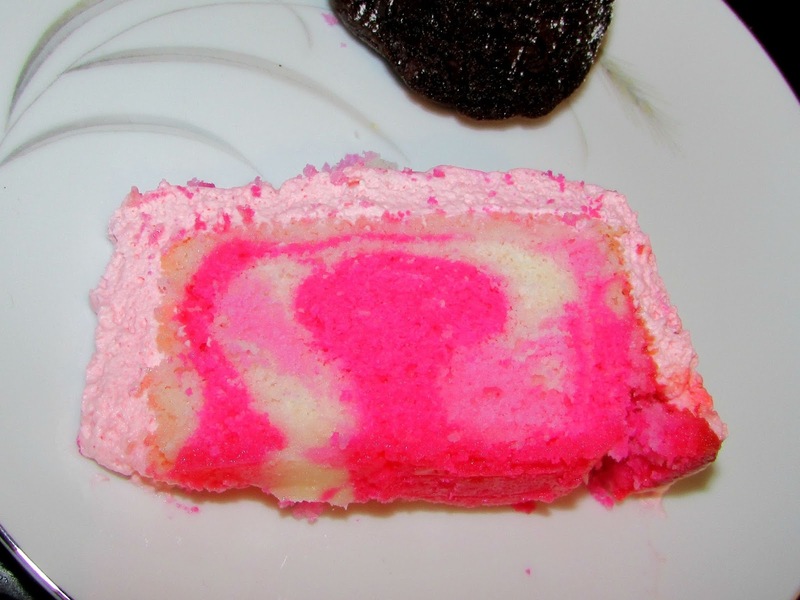 Here is a picture of the inside of the camo cake. We made an aloha punch that was really good, and of course tea and water. We strung up some felt cinnamon buns to bring the theme into the drink station. Here is a close up of the cinnamon buns. They were relatively simple to make once we figured out how to get them to stay together. We strung them up on baker's twine! Here are the take-home treats. 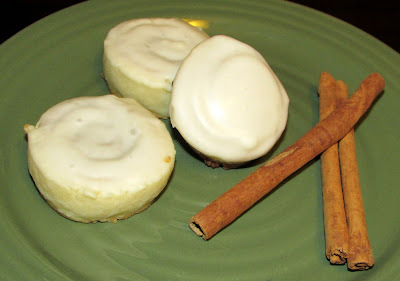 We made cinnamon bun cookies with cream cheese glaze, they were a perfect little treat to match the theme and so darn tasty if I do say so myself! 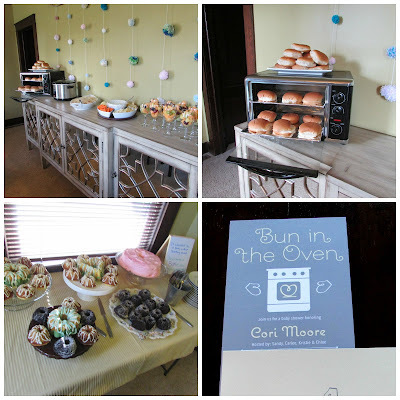 Of course if you are going to have a bun in the oven shower, there needs to be some buns in an oven. We made sure to take care of that! We also put together a pom-pom wall. I got the idea from Stacie at Divine Lifestyle. We constructed it a bit differently, but the idea was the same. Of course there was plenty of food! And I think everyone had a great time. Both of Cori's sisters had really long drives to get here, but we were so excited they were able to come. They are both going to be great aunts to the lucky baby. Below is Cori with all of the baby's grandmas and great-grandmas! Funny. Grandma Rees said we had too much food. This is the same person with a 20 foot buffet that we run out of space on for holiday meals. That doesn't include the drink bar and full dessert bar. She sure got me giggling about that one. She is funny. One of these days I'll have to take a picture of her buffet on a holiday! Better get a wide angle lens. What a fun party and food! We had the best time! 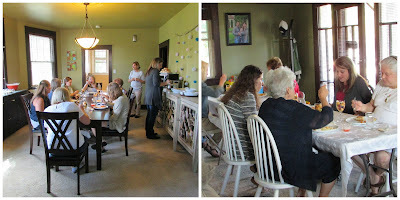 It was a lot of fun to plan and fun to watch everyone enjoy each other's company. Have a great day yourself! Oh goodness this looks like it was so fun!! We had the best time! Thanks so much for hosting! We had a great time! It was fun to plan and even more fun once everyone was here!